¼ teaspoon freshly ground pepper, or to taste. Preheat the oven to 400° F with a pizza stone (or a large baking sheet) inside. 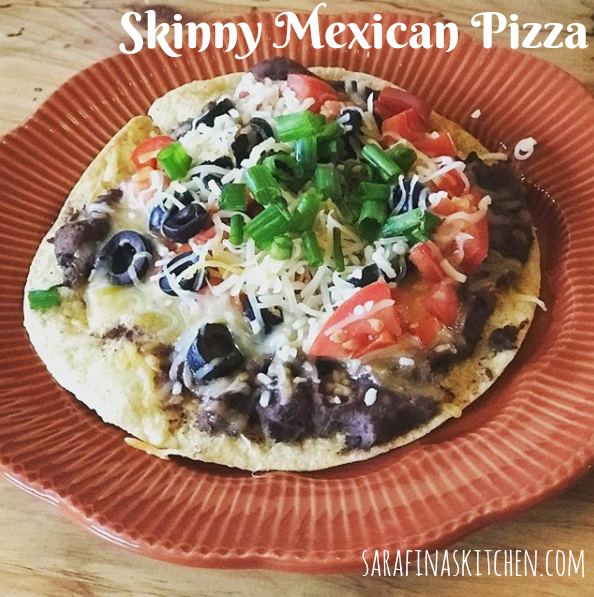 Working in batches, lay as many tortillas out as possible on the pizza stone without overlapping and bake for 10 minutes, or until just crispy. Repeat until all tortillas are crispy. Meanwhile, heat the black beans, paprika, cumin, and cayenne over medium heat until smooth and pliable (it doesn’t need to be heated all the way through, just enough to make it easy to spread). Divide the black beans among the crispy tortillas (about ⅓ cup per tortilla), and use a rubber spatula to spread the beans out evenly to the edges. Evenly the olives, red onion, tomatoes, and bell pepper among the tortillas. Sprinkle 1.5 tablespoons of shredded cheese over the top of each pizza. Bake the pizzas for about 10 minutes, or until the cheese is melted and bubbly and the toppings are cooked through. My pizza stone holds only 4 pizzas at a time, so work in batches if needed. Before serving, dollop or swirl avocado cream over the pizzas, to taste, and sprinkle sliced green onions on top. (To swirl it, I put the cream in a Ziploc bag and cut off the tip!). Optional: serve with a side of salsa. Toss all the ingredients in the food processor and blend until smooth.